In Greek mythology, Actaeon was considered to be a Theban hero, although his heroic credentials are not expanded upon. Actaeon though is famous in Greek mythology for being in the wrong place at the wrong time, a situation which would result in his own death. Actaeon was said to be the son of the minor rustic god Aristaeus, discoverer of honey and Autonoe, the daughter of Cadmus and Harmonia. Therefore, Actaeon was also probably brother to Macris. Nothing is told of the childhood of Actaeon, but it was said that the Theban youth was entrusted to the care of the wise centaur Chiron, who trained Actaeon in the art of the hunt. Hunting would ultimately be the downfall of Actaeon though for it was said that after a day’s hunting with his pack of hounds, Actaeon decided to relax by a nearby pool. This pool was said to be in the Vale of Gargaphia, near the town of Plaetea and Mount Cithaeron. Unfortunately for Actaeon, the goddess Artemis had decided to make use of the pool to bathe in; and so despite the best efforts of Artemis’ attendants, Actaeon saw the goddess naked. 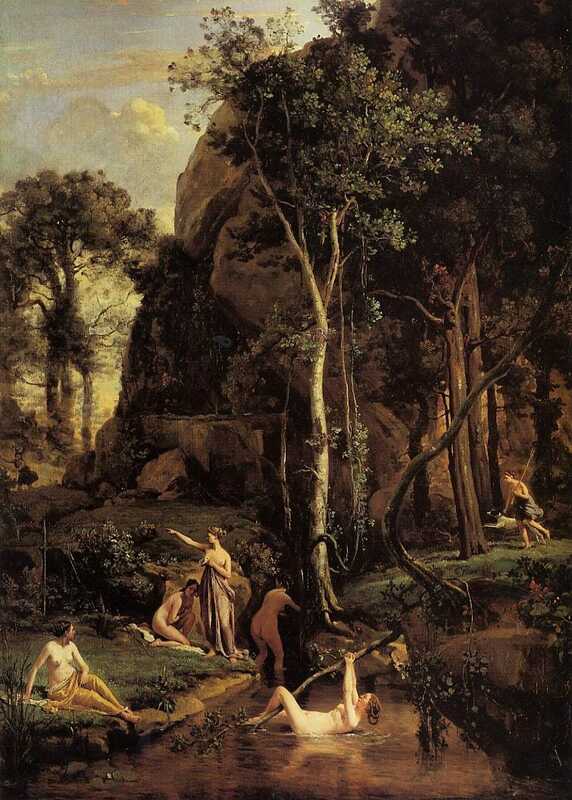 To prevent Actaeon telling others of what he had seen, Artemis transformed Actaeon into a stag though the very water in which she was bathing in. Actaeon caught sight of his transformed self in the pool, and in a panic he ran away quickly, this though caused his own hounds to set off in pursuit. The hound did of course not recognise their own master, and when eventually Actaeon tired, the hounds set upon the stage ripping it to pieces. This is the best known version of the Actaeon myth, although many other writers give different reasons for the transformation of the Theban hunter. Some would say that Actaeon hunted alongside Artemis, and had rashly boasted that he was a superior hunter to the goddess, or else by being in close proximity to the goddess, Actaeon had fallen in love with Artemis and had proposed marriage. 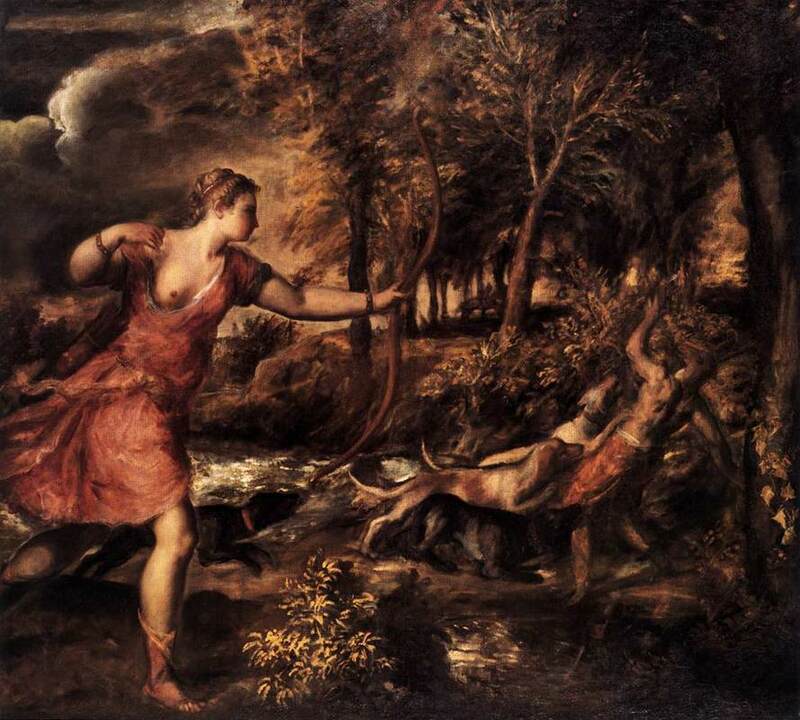 Still others state that Actaeon angered Artemis by consuming game that had been destined to be sacrificed to the goddess. Finally, other say that the transformation of Actaeon had nothing to do with Artemis, but was all due to Zeus, for Actaeon was a love rival when it came to Semele (Actaeon’s aunt). In the aftermath of the death of Actaeon, grief overtook his parents, and Aristaeus was said to have left Thebes for Sardinia, whilst Autonoe left for Megara. The hounds of Actaeon were also grief stricken, and not realising that they had killed him, search as a pack for him. Eventually, the hounds came to the cave of Chiron, and the centaur, to soothe their grief, crafted a lifelike statue of Actaeon, around which the hounds could gather.